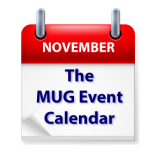 A combination of the crossover week between months and the U.S. Thanksgiving holiday means a quiet, but not completely quiet, week on The MUG Event Calendar. Apple itself will visit a California creative pro group to show off the latest and greatest version of Final Cut. Another California group will look at Sierra, among other things, and an Australian group will hold a digital film festival.